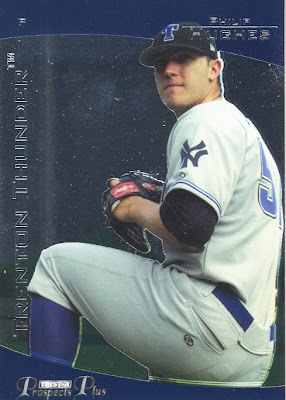 I’ve always liked this card of Phil Hughes. I got the card while I was watching the Trenton Thunder play at Fisher Cat Stadium in 2007, but Hughes was in Scranton at that point. I decided to feature him because he’s really been the talk of spring training so far, along with Joba Chamberlain. Who will win the battle for the fifth starter? Nobody knows yet. Hopefully you caught the amusing sound bite from Hughes after yesterday’s workouts on LoHud.